In 2010, Graham Brown needed a t-shirt design for his emerging Anderson-based Hip-Hop band, Anderson’s Most Wanted. He crafted what has become the brand’s most recognizable image: six vertical stripes with the state of Indiana in the top right corner. The design was simple, but struck a chord with Hoosier hearts. Brown soon partnered with The Art Press, a local printing company, to help him keep up with the consumer demands. Over 15,000 pieces later, USI has countless designs and high-quality clothing options for purchase. USI offers more than just trendy hometown designs; they also provide t-shirt designs inspired by local non-profits with the proceeds going towards the organization behind the design. They previously partnered with Nine13sport, a youth education program to get children excited about living healthy and active lives outside. And just recently released the pre-sale for their t-shirt benefiting the Virginia Avenue Folk Fest, with proceeds going to Trusted Mentors that helps at-risk adults establish stable lives. 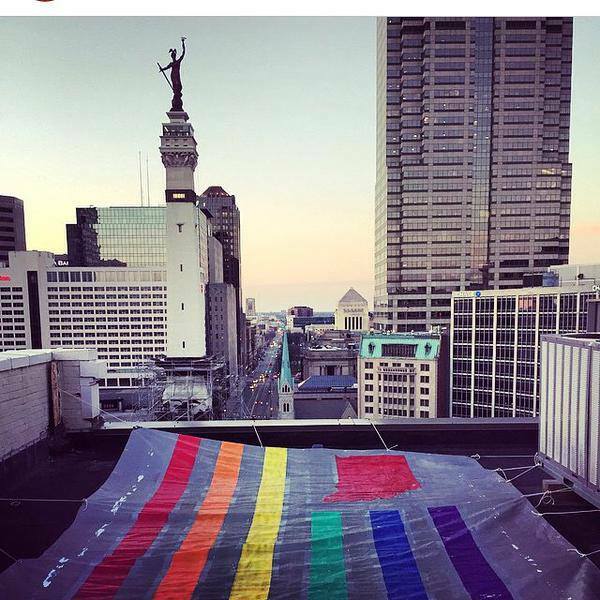 USI also showed their opposition towards RFRA by displaying a giant sized t-shirt resembling their popular rainbow pride design on a rooftop in downtown Indy. USI’s products are top-notch. The t-shirts and tanks are comfortable and well made. And maintain the brand-new look and quality after multiple washes. You can purchase USI’s products at local retailers across the state or visit their website. And while they might be pricier than your typical t-shirt, remember they aren’t just trendy apparel brand, but a sense of Indiana state pride. Hello, after reading this remarkable post i am as well happy to share my know-how here with colleagues.